Age is a crucial component of egg freezing because of three main issues: it impacts (1) the likelihood your eggs will work if you need them; (2) the number of cycles you’ll end up wanting to to do; and (3) the likelihood that you’ll ever need to use the eggs you froze. One caveat: we use the words “younger” and “older” only in the context of a woman’s general window of fertility. “Younger” generally refers to women who are in their mid-30’s and younger, and “older” referring to women who are in their late 30’s and beyond. We realize that the fertility field is probably the only realm in which “older” would be used for that category. Thus, generally speaking, young women who freeze their eggs are more likely to have eggs worth freezing, but are less likely to need them. Older women are more likely to rely on their frozen eggs but often must do more cycles for their frozen eggs to be useful. Below is one study that illustrates this concept. A Spanish center broke down the live birth rates for women who froze their eggs and returned back to use them -- results are displayed based on the age at which a woman froze her eggs, and how many eggs she stored at the time. This study has its flaws, but in our minds, it’s the best information we have available today. The study represents the largest sample of outcomes from women who chose to electively freeze their eggs. The shortcomings include: a small sample size (300 patients), the data is from a single center, and the age brackets (35 and younger vs. 36 and older) are crude. Thus, it’s hard to say how generalizable these observations are to all patients. You’ll see that women who froze 10 eggs by the age of 35 had nearly double the rates of successful pregnancies compared with women who froze the same number of eggs at 36 or older. What’s more, it becomes much less likely for “older” (age 36 and beyond) women to capture those 10 eggs in a single cycle, as evidenced by data below from a clinic in New York showing how many eggs were retrieved by age. Thus, an advantage to freezing one’s eggs younger is that what she collects in each retrieval is more likely to be sufficient to lead a live birth. Naturally, patients want to retrieve more eggs and, for this reason, many push their doctor to prescribe higher doses of hormones or to delay their retrieval another day. 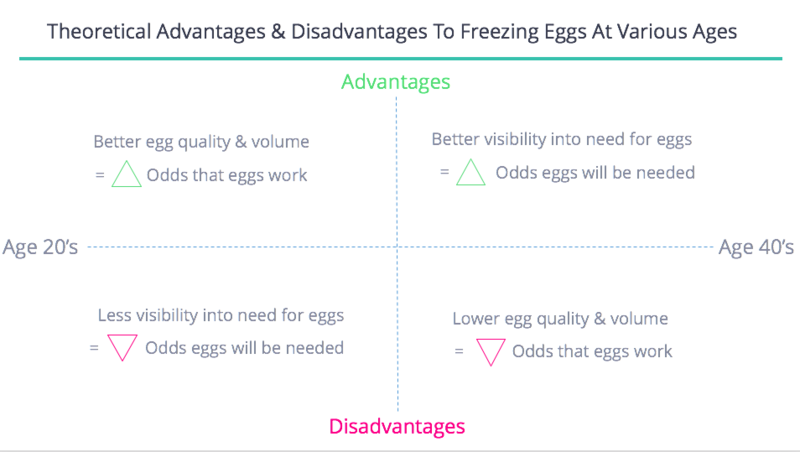 It’s unclear if these tactics increase the number of useful eggs (often only mature eggs can be frozen) and may well come with risks, namely over stimulating the woman into a state of OHSS (see our lesson on “The Risks of Egg Freezing”), or maturing the eggs too much. According to the two largest studies available, women who froze their eggs have, so far, returned back to use them in only about 10% of cases. Today our data tells us that the women who froze their eggs in their late 30’s have most frequently returned back to use their eggs, and they do so an average of two years after they were frozen. The belief is that these women had a strong sense they would need their eggs by the time they choose to bank. Thus, older women who freeze seem more likely to actually use their eggs. How often do women who froze their eggs at younger ages return? For the moment, it seems far less often. The conventional wisdom is that these women may choose to freeze, then find a partner and manage to conceive naturally. But whether this is actually the case is unknown -- we need more time for these younger freezers to mature and to see if they return back at later ages to use their eggs. We simply haven’t been doing elective egg freezing for long enough to know the answer. This is the principle reason that younger women are advised against doing egg freezing. However, you need to calibrate whether this is a sufficient reason not to freeze your eggs. Some women will freeze their eggs in the remote chances they are needed, and if they conceive naturally, are still pleased with the decision. Other women may be unhappy if they invested the time and money into egg freezing and ultimately never use their eggs. If you believe you’ll eventually need to do IVF, you’d far prefer to be doing it with younger eggs. 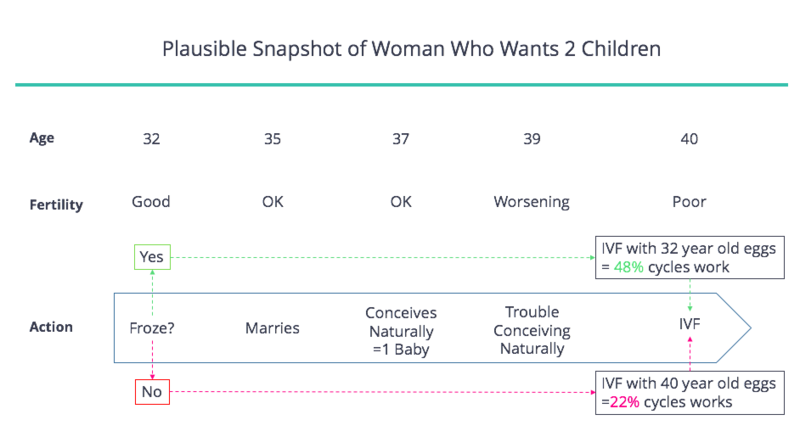 Below is data on how women with younger eggs fare significantly better in the IVF process. One thing we believe is often overlooked in this discussion is what a woman’s family building goals are. In many senses the question is not whether she’ll be able to conceive her first child naturally, but whether she’ll be able to conceive her last child naturally. If the answer is no, and ultimately she resorts to doing IVF, then she’d certainly prefer to undergo fertility treatment using her frozen, younger eggs. The reality is that a third of IVF patients are in treatment due to secondary infertility (meaning they’ve already had a child and now they’re trying to conceive again). For example, a woman might get married at 35 and be perfectly fine conceiving her first child at 37. But it’s entirely possible that she’ll have a harder time if she wants to conceive again at 39 or 40. In which case, she’d rather be starting fertility treatment with her younger eggs than her eggs at 39 or 40. As you saw in the chart above, IVF with 32 year olds eggs has a nearly 50% success rate. IVF with 39 - 40 year old eggs is successful less than half as often. The same holds true for women even at later ages. For example, if a woman gets married at 39, and wants to conceive at 40, it’s possible that she’ll get pregnant naturally. But trying again at 42 or 43 makes the odds lower that she’ll be successful on her own, so she might want the option of using eggs she froze earlier. We often hear people refer to women freezing “too late” as “preserving infertility” rather than “preserving fertility.” We think the assumption that freezing eggs at, say, 40 is a “waste” likely rests on an unhelpful comparison. Sure, if a woman freezes at 40 instead of 30, she won’t have the same likelihood of success. But, if a woman feels that she would use IVF in the future if she has difficulty conceiving, as you can see below, then she would be much better off using those frozen 40-year-old eggs in comparison to her later 42-year-old or 44-year-old eggs. So, again, this is personal. Consider whether you think you’d be willing to try IVF in the future with your own eggs if you have trouble conceiving. If the answer is yes, then freezing at a relatively older age can still make sense. The amount of money that you’ll spend on freezing your eggs and storing them can vary drastically based on which age when you decide to freeze. We’ll cover this in great detail in our next lesson on cost, but at a very high level: younger patients will likely have lower up-front fees on medical expenses and drugs but they’ll rack up larger storage bills over time; older patients will likely have higher up-front fees on medical expenses in the form of more cycles and higher drug doses, but they'll likely spend less on years of storage.